Let the nations be glad & sing for joy! For our final post, I though we’d do a snap shot summary of our missionary experience, from the time we were accepted to our final goodbye from the field. 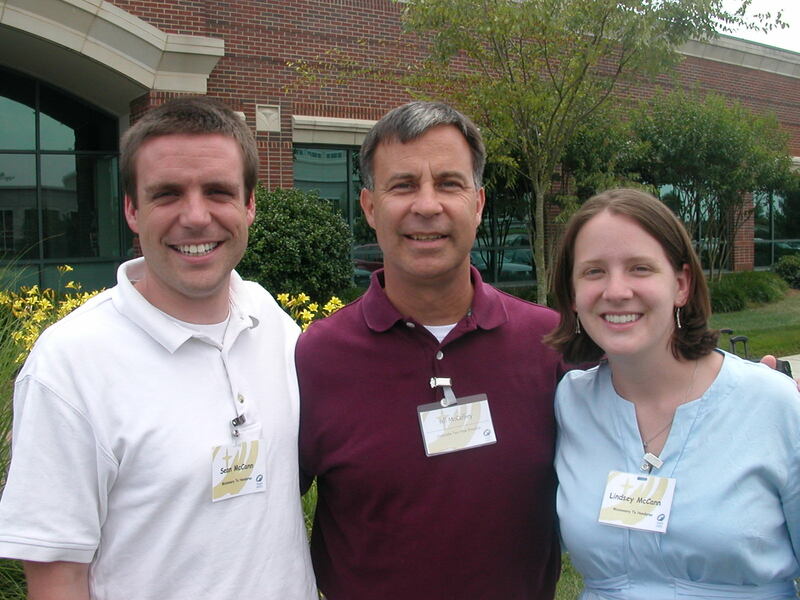 Our process started in June of 2006. After lots of prayer and research, we felt God calling us to be a part of the new team in Honduras. We spent a week at the MTW headquarters going though interviews and beginning our training. 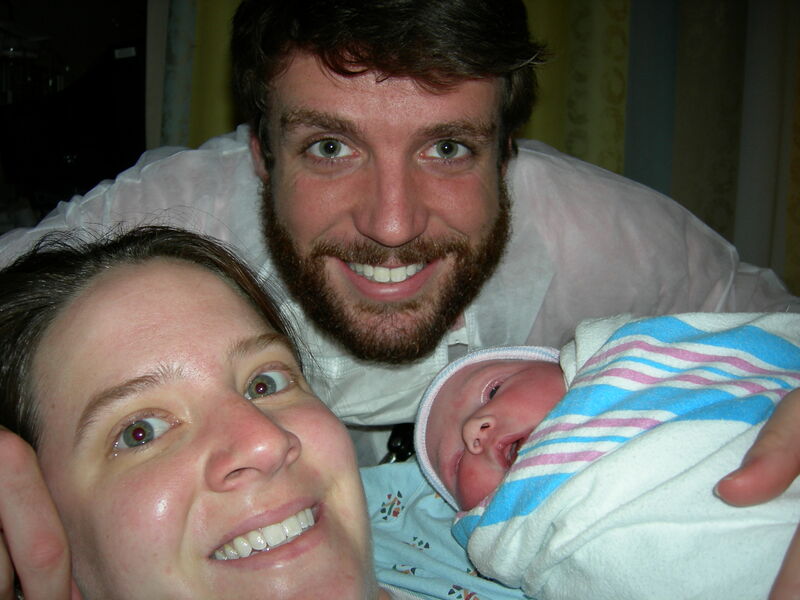 On October 24, 2006, Lucy was born in Charlotte, our first and only child born in the US. After Sean graduated from Reformed Theological Seminary in the summer of 2007, we had another week of training in the NC mountains at an MTW spiritual life conference. 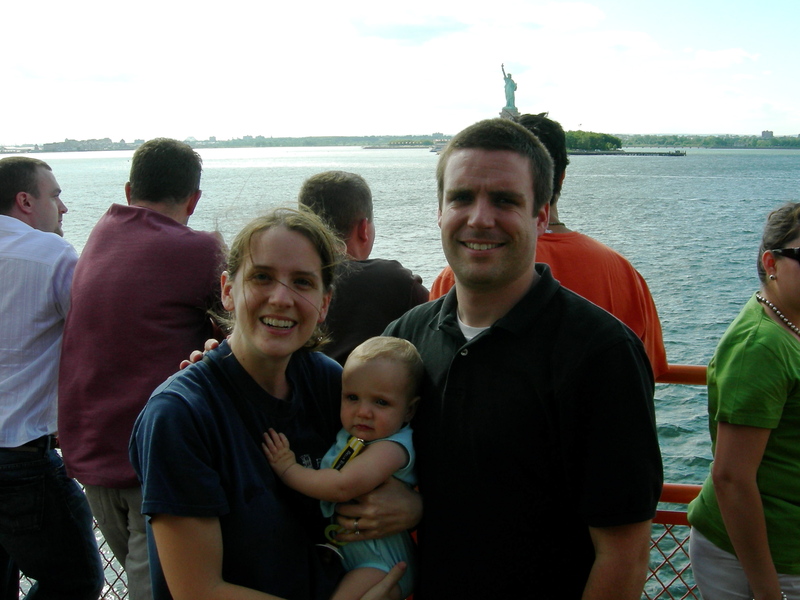 Just a few weeks later, we toke our little family to New York City for a month of Pre-Field Training. 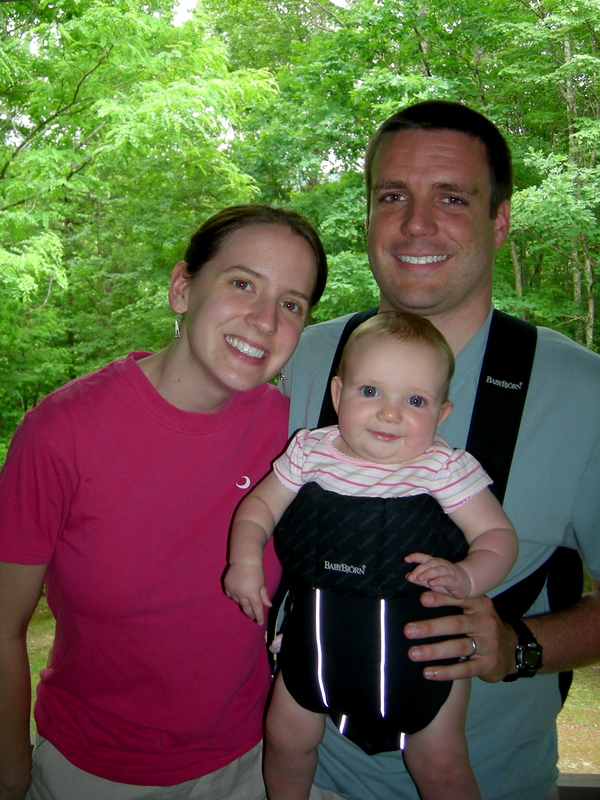 We then spent 6 months as part-time parents, employees, and fund raisers. 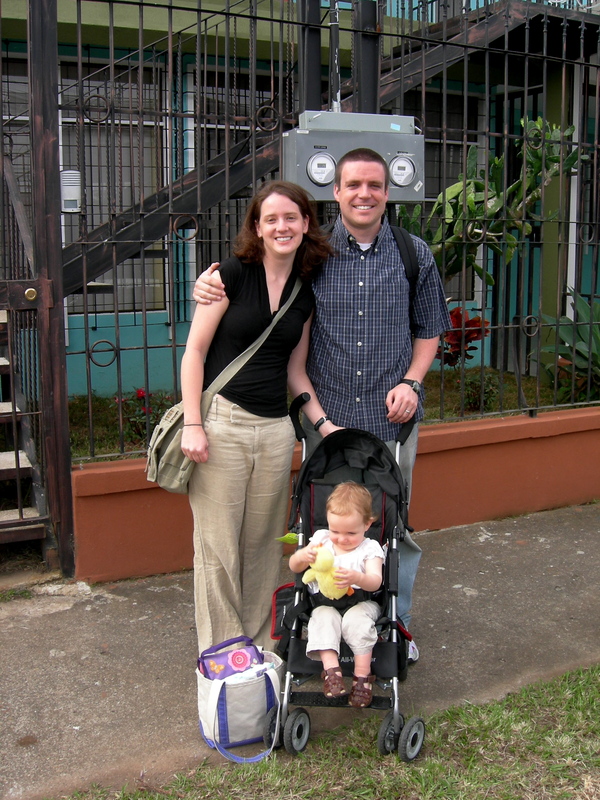 Once we reached 100% of our support goal, we headed to San Jose, Costa Rica, where we arrived in February of 2008 to begin at the Spanish Language Institute. 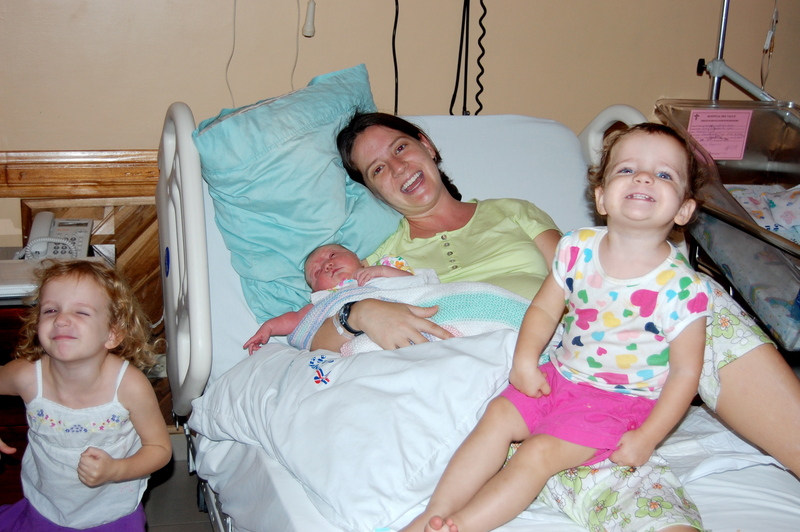 One week into our international journey, we found out we were pregnant with Ellie. After months of Spanish immersion and finally language school graduation, Ellie was born in San Jose on October 30, 2008. Sean rushed around for weeks and finally got all her paperwork so we could make it home for Christmas. 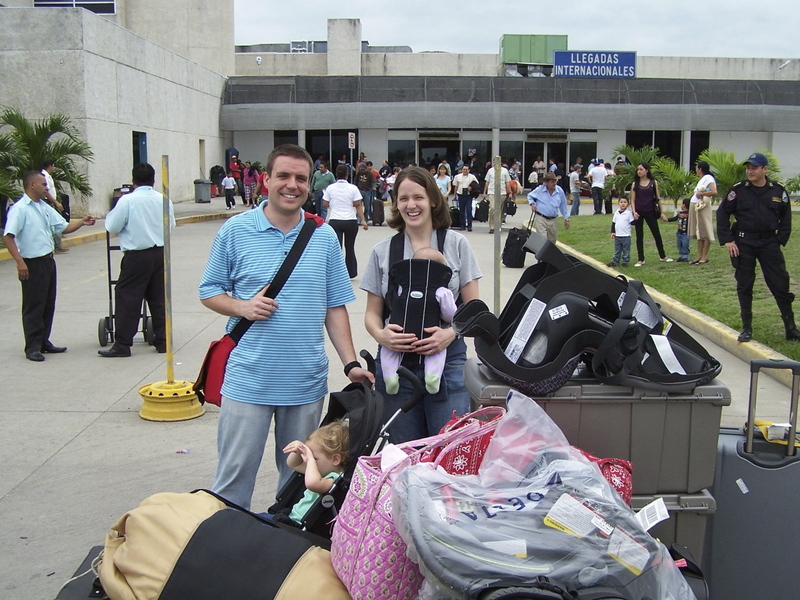 After visiting family and friends for the first time in a year, we packed up for Honduras, where we landed in January of 2009. Our first year was a blur of heat, ministry, lots of teammates, and growing kids! 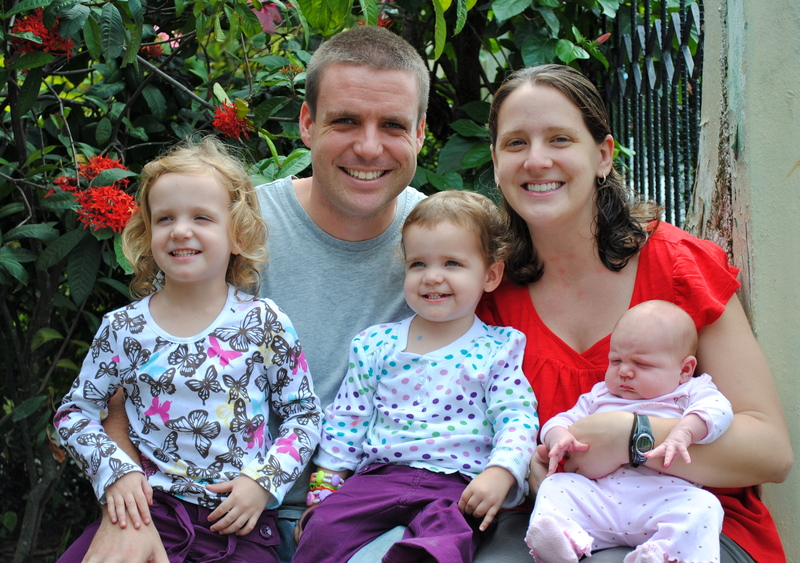 Towards the end of our term, Anna was born in San Pedro Sula on October 24, 2010. She was probably the fattest, whitest baby the hospital had ever seen! And finally, in March of 2011, we said our goodbyes and returned to the US for good. It has been quite a journey, and thanks for following along with us here. 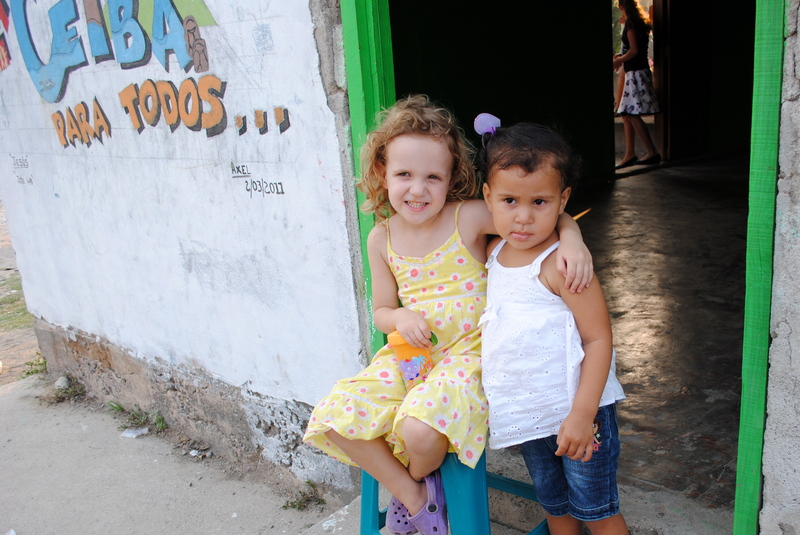 We saw God at work in Honduras in so many ways, but he also used Honduras to work on us. Our faith deepened and our love for Jesus grew. 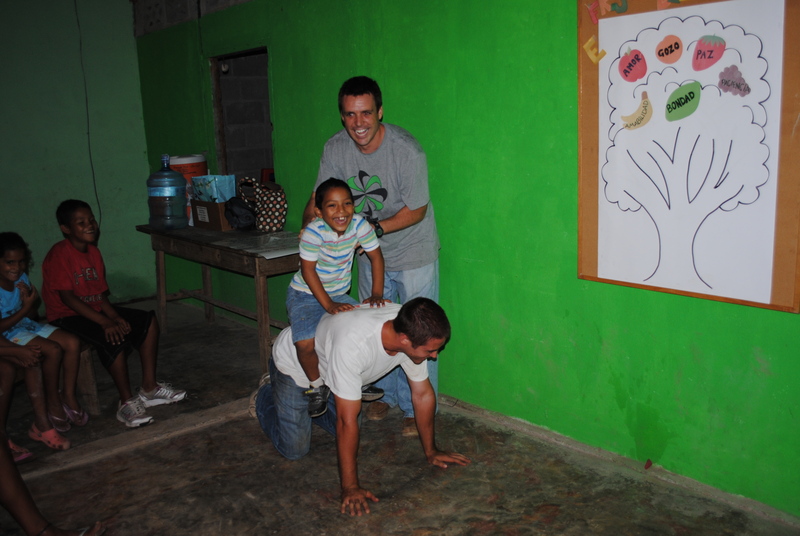 Although our time in La Ceiba has ended, the team there is growing and working as hard as ever. Keep up with them and their stories through all the website links on this page. After a series of painful goodbyes and lots of packing and repacking, we made the long trek from La Ceiba to North Carolina. Last Wednesday we had a team dinner and said some tearful goodbyes to our teammates who have become like family to us. As we drove off on Thursday morning the girls were in great moods and happily waved goodbye to all the places they knew on the way to the airport. After a draining few days, it was a relief to have a calm and stress-free day of travel. In the days since our arrival we’ve been trying to get some rest, while also preparing for our new lives and ministry here. We’ll post a final update soon once we get settled down a bit more. The day we have been dreading came and went. Yesterday we had a goodbye party in the village of Armenia Bonito, the place where we have poured out our hearts and lives for the past two years. There was a big turnout and the kids were amazingly well behaved. It was a tough goodbye for us, but a great ending to an amazing two years. 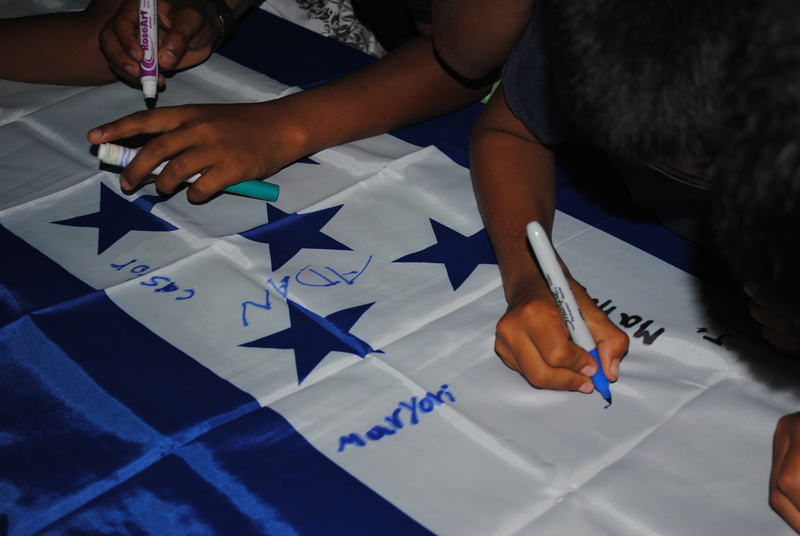 For a requerda, all the kids signed and wrote notes on a big Honduran flag. The kids loved the idea and many Hondurans assured us that it wasn’t at all an insult to the flag. It is definitely something we will cherish for years to come. Here is Lins with some of the girls she was closest with. 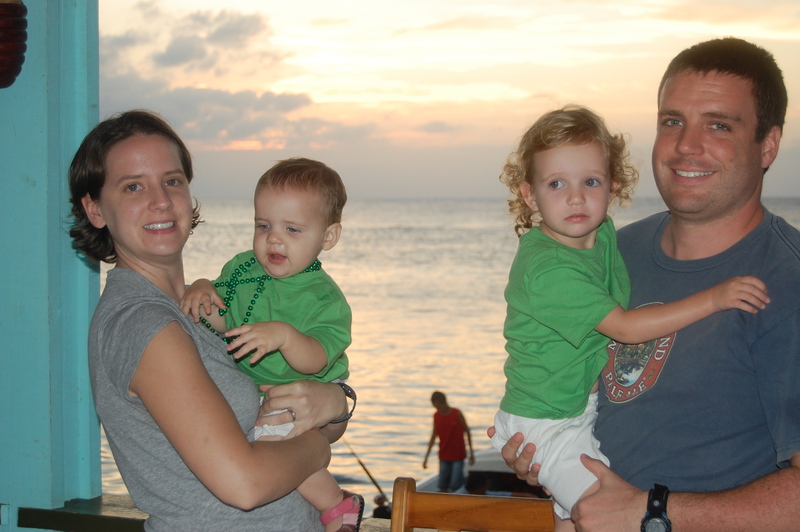 Lindsey had such a difficult job of balancing her role as a mom (an awesome one at that) and her role in Armenia. Her role changed many times while we were here (mom with an infant and a toddler, mom with two toddlers, pregnant mom with a toddler and a preschooler , mom with an infant, toddler, AND preschooler, you get the picture), but the thing that stayed the same was that the Armenia girls loved her and asked about her every single day. For someone with such little time and energy to give outside of our family, she had an amazing impact that will last for a long time. And lastly, our little, moody Lucy. The kids loved her, but they never knew which side of Lucy would show up each day (and frankly, neither do we.) Sometimes Lucy is playful, sometimes she would hit other kids, sometimes she wanted to be held, sometimes she cried, sometimes she yelled at everyone near here. And every once in a while, she would pose and actually smile at the camera. Kathy captured one of those rare moments yesterday with her friend Naiomi. As we drove off one last time, it was surreal and very sad, but we were at peace. God brought us to this place and to these kids for a season, and it was an incredible ride. But it’s over, and now we’re ready to move on to the next challenge, knowing that as always, that God is forever faithful. 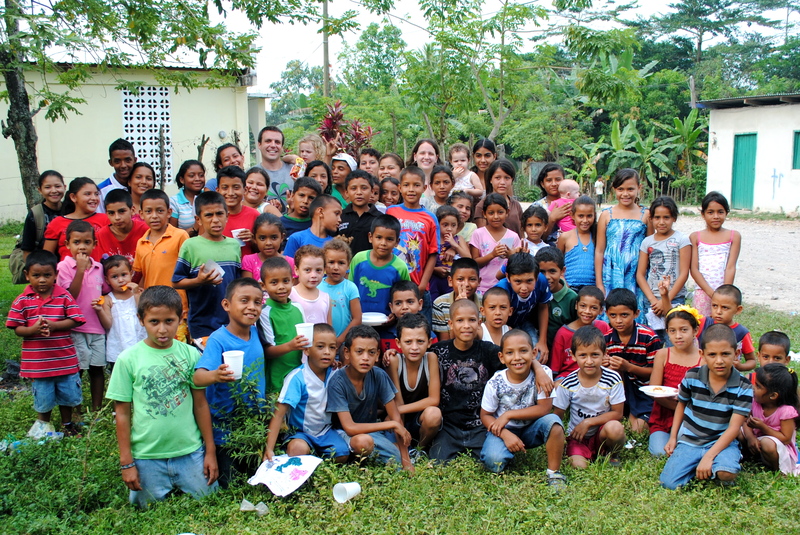 Over a year ago, our team started down the path of constructing two ministry centers. Although these projects have not been the main focus of our ministry, we’ve still been involved in planning, leadership, and construction. We started construction on this ministry center over a year ago and haven’t stopped since. The facility is located on a 2 acre property in the middle of Armenia and will house a number of different buildings. 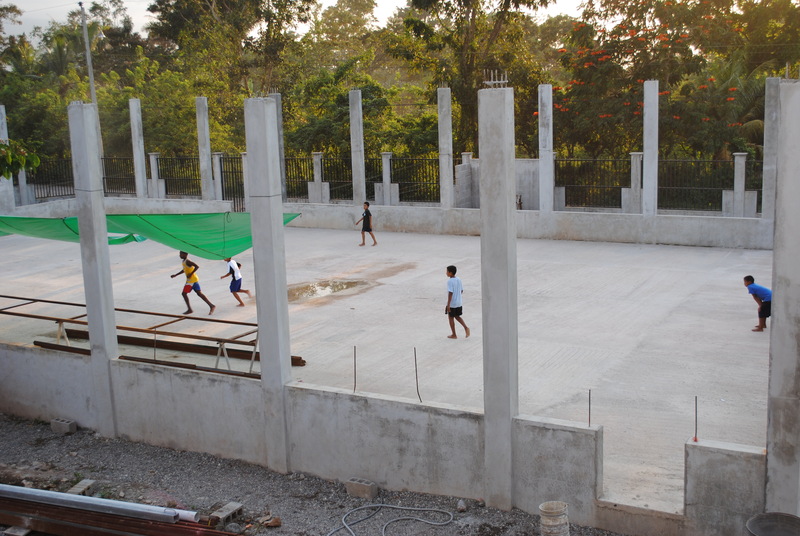 The first major building to be completed will be the Christian high school, followed closely behind be the soccer field. In the coming years the team will oversee the construction of a medical clinic and hopefully their first church plant in Armenia. Through the project the team will minister to the community through the avenues of medicine, sports, education, and faith. Our team’s outreach will always be relationally based, but the project adds structure and permanence to our work. As I said before, our work here has not centered around the buildings, but around people. One thing about working with people (similar to raising kids) is that the change is not so obvious and apparent. We know God has used us in many ways, but the evidences of that work are not as simple as pointing to a building that was once an empty lot. We look at these buildings then as symbols of the relational and spiritual work that God has done in people’s hearts through us. Hearts that were once barren and filled with trash now have the kingdom of God growing in them. 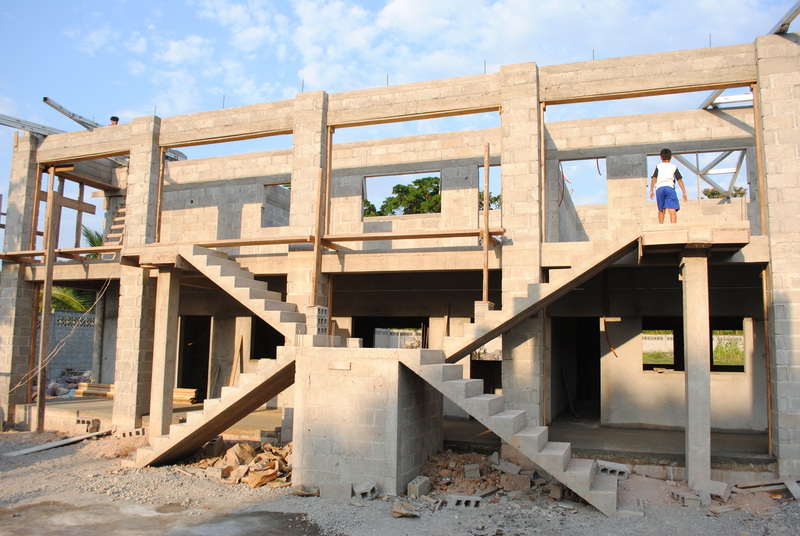 Just as these constuction projects give hope where there once was none, we have seen greater hope built in the lives of Eduardo, Wilma, Samuel, Oneida, Ariel and Ever, Casandra and Erika, Argentina, Carlos and Tony, Gracie, Sergio and so many more. The kingdom of God is spreading here in Honduras, both physically and spiritually, and it has been a joy to have been a part for these past few years. As we woke up this morning we realized that this is our last full week in Honduras. In 10 short days we’ll be boarding a flight to the US and closing this chapter in our lives. After two long years, it is a very surreal feeling to know that very soon La Ceiba will no longer be our home. We’ve been trying to soak up our last days with friends and enjoying some of our favorite spots in town. This past week we’ve hosted some Armenia girls for games and cook baking, taking some boys to the river, gone to the beach with some friends, went to a last soccer game with the boys, and eaten at some of our favorite restaurants. This week we will have some last meals with friends, as well as goodbye parties at our church and in Armenia. Yesterday our pastor prayed for us at church, and as he was introducing us, he commented that our time here in our “Honduran school” had come to an end. His point was that God had us here for a season of not only ministry and outpouring, but also to learn more about God and more about ourselves. God has used us to work in Honduras, but also Honduras to work on us, and I know many of the lessons we learned here will last a lifetime. 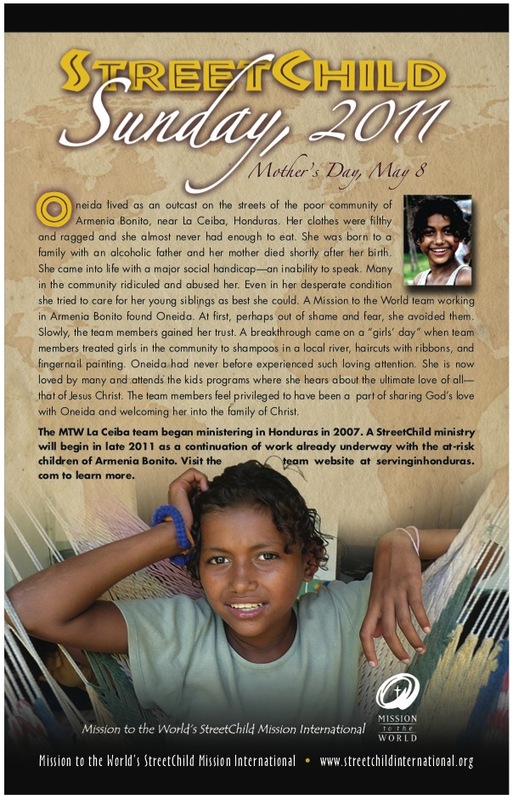 In a couple months is MTW’s annual Street Child Sunday, a day when our organization raises awareness in churches around the US of the plight of homeless children around the world. This year’s bulletin insert tells the story of Oneida, a young girl who we’ve all come to know over the past few years. It is a sweet story, and one that we’ve been privileged to be a part of. Sadly, Oneida’s plight is not over, but rather one that will continue the rest of her life. Please pray for her, and for us as we seek to love and help her in any way we can. Last week in Kids Club we continued our series on the fruit of the Spirit and covered kindness. To help the kids memory and to keep up with the fruit theme, each week we match a real fruit with each Spirit “fruit.” The kids enjoy putting the matching fruit on their personal tree, as well as the fruit snack we provide at the end. We’ve also been enjoying some time with the boys in the afternoons. 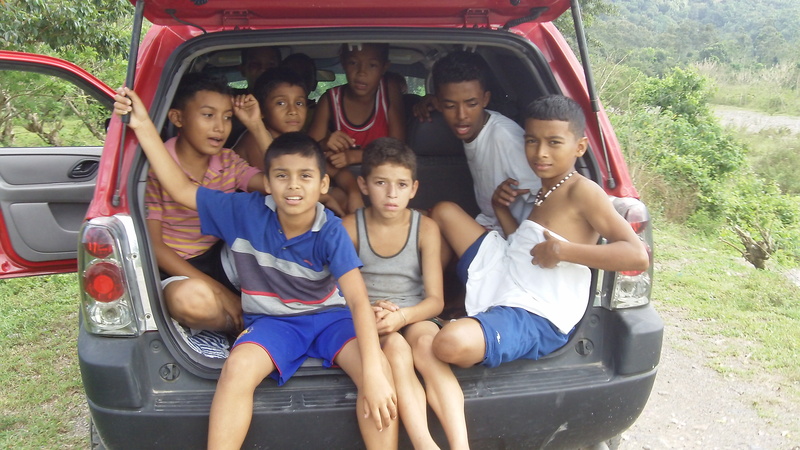 They love playing futbol with us on our court, and then heading to the river afterwards. Last week they even volunteered to wash our car while at the river, which was a nice treat. This Spring we’ve been continuing our English classes in Armenia. 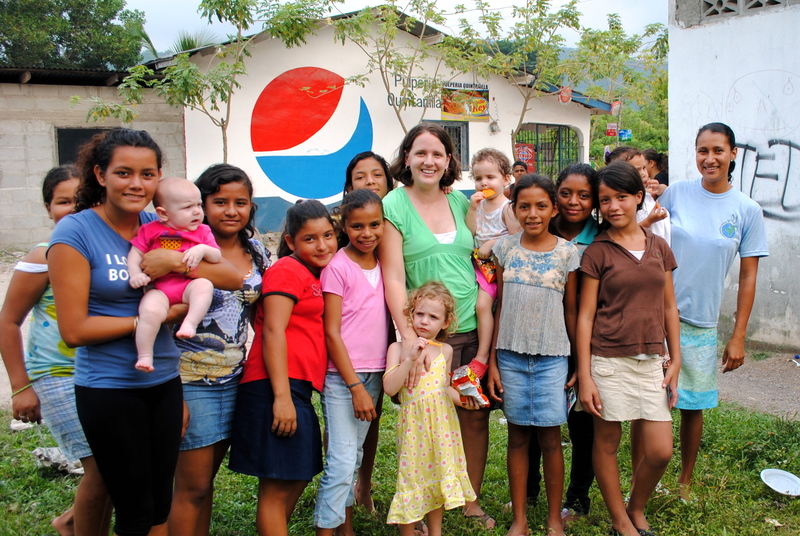 Bethany has taken the lead on teaching the classes, and the kids are really enjoying her as a teacher. She’s been teaching the kids bible verses in English, along with common questions and answers. Last week she introduced some animal vocabulary words, which they loved and practiced on all the community animals on the way home. Last Saturday, the ladies on our team planned an event to bring some of the women from Armenia out to the beach. Every time we take the kids to a special beach day, or game night at our house, or the boys to a soccer game, their moms ask us when it will be their turn! The ladies specifically invited moms with younger kids who never get a chance to get away. They spoiled the women with some gifts, including nail polish which they loved putting on each other. They spent the day swimming, napping in the hammocks, playing on the beach, and enjoying lunch. Lindsey also led a small bible study during lunch. Everyone seemed to have a great time and turely appreciated the treat of a day away, without their kids, at a beautiful beach. Despite the rule that no one was allowed to bring their kids, Anna came along to make sure she could get some food during the all day event. And as usually, there were no lack of hands to help Lindsey care for her. On Saturday we finished up a great week with our short-term team from the US. The team came down hoping to really focus on some construction projects, but after some passport issues in the US, they arrived short-handed. 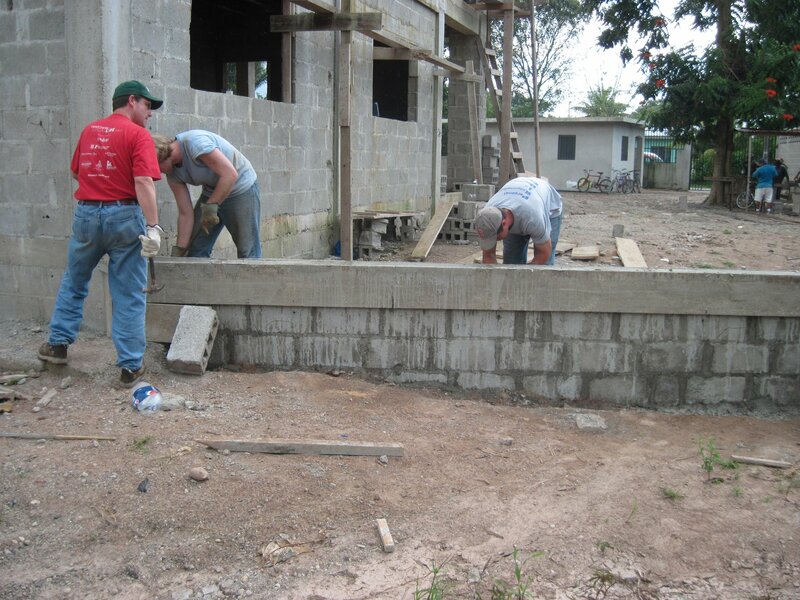 This didn’t slow them down though as the began and finished a retaining wall for our high school in Armenia Bonito. 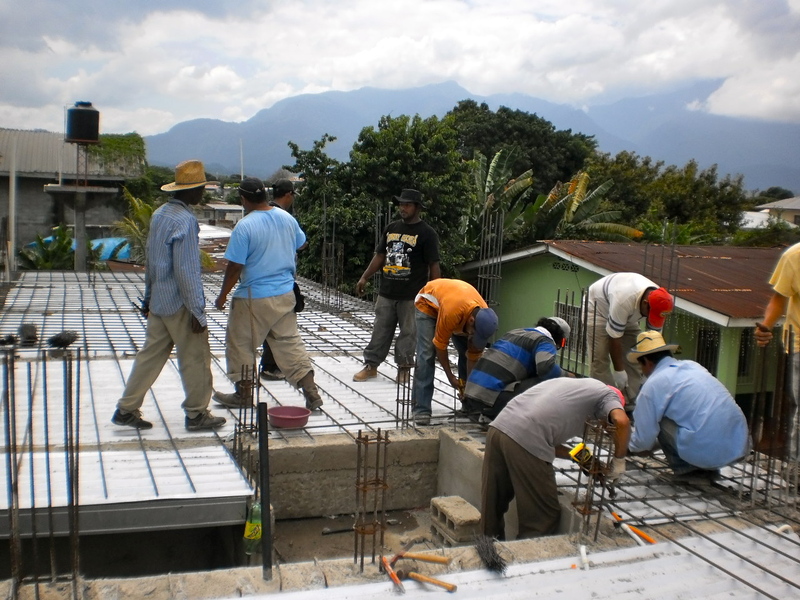 They also worked hard on our La Isla downtown property, mixing concrete and pouring headers on our dorm facility. On Thursday they also helped us host a health clinic. They had collected stuffed animals and cards from a school in the US and gave these out to all the sick kids who claim to they clinic. 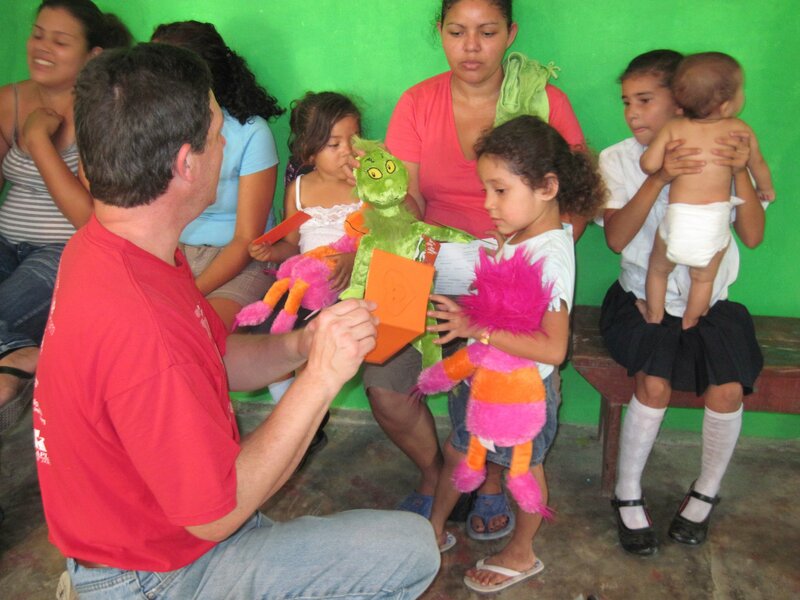 They were a hit and a great comfort to the sick little boys and girls. The team was a great encouragement to us as they jumped right in and worked long, hot hours. Welcome to our website. 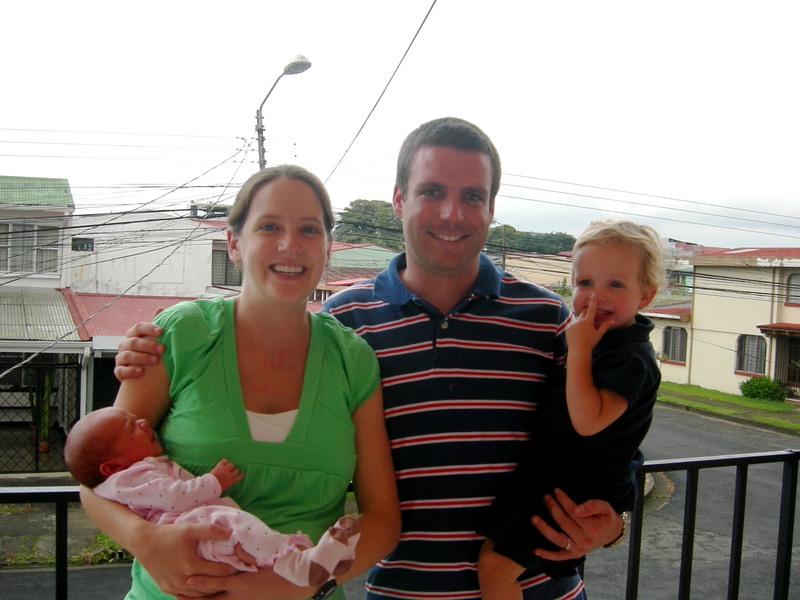 We are a young family who have moved to La Ceiba, Honduras to hopefully start churches. We have set up this website for you to learn more about us, our new home, and our ministry. Please look around and feel free to leave us a comment, send us an e-mail, or give us a call, we would love to hear from you. Enjoy!